I was very disappointed when earlier this year the Syracuse Hydrofest was cancelled due to high water levels on Onondaga Lake which I have enjoyed photographing the last two years. 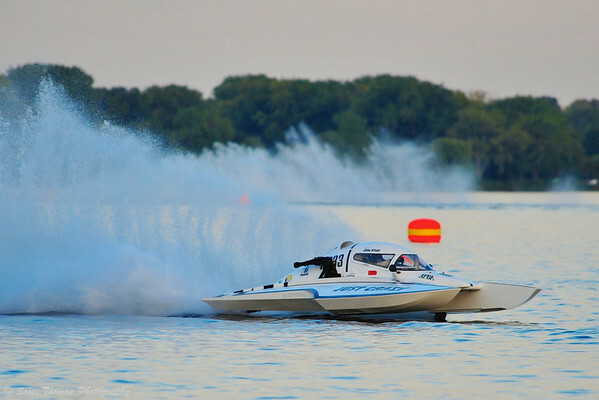 Lucky for me, a new inboard hydroplane race was being held this year on Seneca Lake in Geneva, New York called HydroBowl. As you will soon see, Seneca Lake is not just about wine and beer. HydroBowl featured vintage racing boats like the J-444 Big John’s Edelweiss which was a multi-year champion back in the 1970’s. The vintage boats did not race. Instead, they did “fly-bys” so the spectators could enjoy seeing the boats on the water. The vintage racing boat J-444 Big John's Edelweiss doing a fly-by at the HydroBowl on Seneca Lake in Geneva, New York. Nikon D700/80-400VR, 1/800s, f/5.6, ISO 320, EV +0.3, 400mm focal length, cropped. The day started out with overcast grey clouds which was reflected in the lake’s waters. As the day progressed, the clouds dissipated and a sunny blue sky came out to create a beautiful early autumn day in the Finger Lakes. To celebrate, I slowed down my shutter and did some panning attempts of the Grand National Hydro class heats. Grand National Hydro (GNH) hydroplane Show Time Racing competing at the HydroBowl on Seneca Lake in Geneva, New York. Nikon D700/80-400VR, 1/125s, f/18, ISO 200, EV +0.3, 400mm focal length. My favorite class is the 5.0 Liter inboard hydroplanes who can reach speeds of 150 mph (241 kph) and tend to have very close races with the high skill levels of the drivers and teams. The photo below will give you an idea how close to the edge hydroplanes get during a race. They do literally fly over the water’s surface. 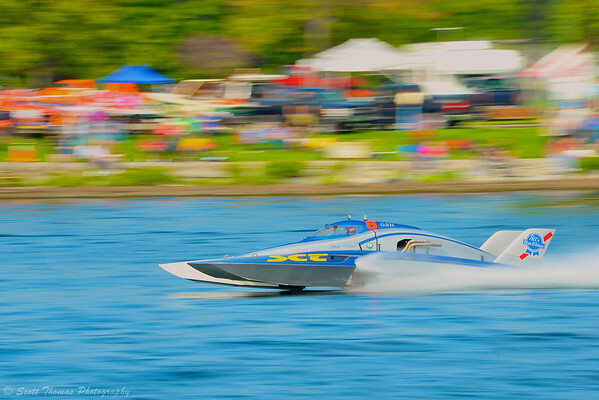 5.0 Liter Inboard Hydroplane flying down the front stretch at the HydroBowl on Seneca Lake in Geneva, New York. Nikon D700/80-400VR, 1/1000s, f/5.6, ISO 200, EV +0.3, 400mm focal length, cropped. The race day went late into the afternoon and the Sun dipped below a bank of clouds to the west of the race location. The sky was still blue above and the mix of less light and low angle of the Sun created a bluish-grey color in the roostertails and water as the boats finished up the last of the heat races. 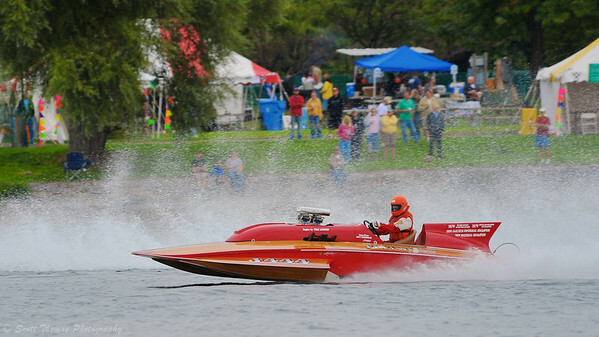 John Krebs drives the National Modifed Just Crazy (NM-233) at the HydroBowl on Seneca Lake in Geneva, New York. Nikon D700/80-400VR, 1/1000s, f/5.6, ISO 720, EV +0.3, 400mm focal length, cropped. I want to thank the HydroBowl organization for bringing inboard hydroplane racing back to the Finger Lakes. The setting was beautiful and there was a good crowd for a new event. The racers I talked to really enjoyed the venue and are looking forward to returning next year and for years to come. I saw a lot of competitive racing last weekend which reminded me to remind you this month’s assignment on competition is due this week. BONUS: I had this idea. 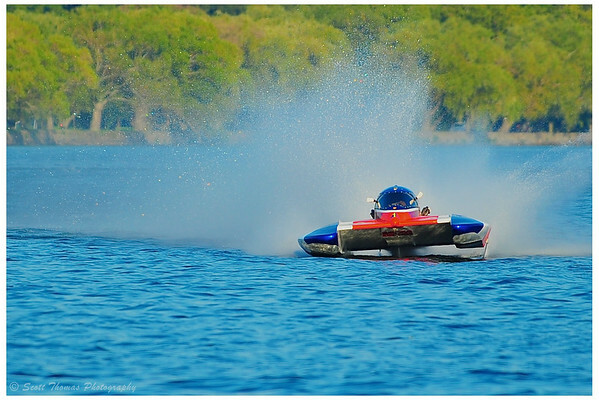 What would a panned photo of a hydroplane look like after being tone-mapped in Photomatix Pro’s Plugin for Aperture 3? I think it looks pretty good! 2.5 Liter Stock hydroplane Grafx (CS-6) racing at the HydroBowl on Seneca Lake in Geneva, New York. Nikon D700/80-400VR, 1/125s, f/22, ISO 200, EV +0.3, 400mm focal length, tone-mapped in Photomatix Pro. 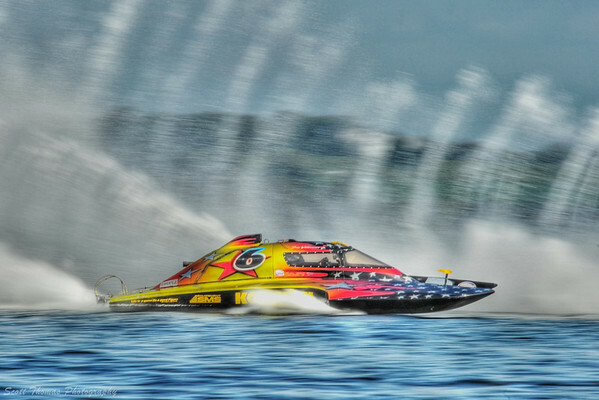 This entry was posted in Sports, Weekly View and tagged 80-400mm, apple aperture 3, autumn, finger lakes, geneva, hydrobowl, hydroplane, inboard, motorsports, new york, nikon D700, panning, photomatix pro, racing, roostertails, seneca lake, tone mapping, vintage, vr, water. Bookmark the permalink. Can’t decide which one I like best… probably the last one. That one is cropped quite a bit already. I’m going to do a few more tone mapped version of some of the photos. I like the painterly look to them. My fav is the second as it conveys the speed so well. The rapid environmentalist in me, wonders how much gas these boats are burning ? Not a lot as their races only run for about 10 minutes. Most use alcohol based fuels, too. That last shot is super, Scott. I was testing my new camera watching my son and his team playing football yesterday, maybe there is a photo for your latest assigment here?! I hope I will have some time before Wednesday to look at my test-results! New camera? Please, tell me more, Truels. Nice! Love the color-blur in the second shot and that last shot is simply fantastic! Thank you, Tracy. I had a blast taking panning shots. Might post more later this week. I have never seen boats like these before – they are pretty wild looking. Your action shots are wildly good! The big Unlimited Hydroplanes which use jet engines or bigger engines were popular back in the 80’s. These are smaller boats and have a lot of weekend warriors much like local auto racers. These people are passionate about their sport and are a lot of fun to be with. Awesome shots, I can’t decide which one I like best. I would love to see this in person. I like the second photo best. It’s awesome! Your hydroplane photos always remind me of when my brothers had hydroplanes. The Finger Lakes remind me that is where my grandma’s parents lived. Your post was a cache of memories today. Photos do save memories so not surprised that they bring back old ones, too. Very nice shots with water action and oh so colorful! I really like the 2nd photo… awesome! Melia shared these with me as I drive her “Deja Vu” as well as my “Just Crazy” you posted on your blog page. I can’t wait to see all of them from both days, I guarantee I will be ordering some. We put on quite a heat race in the National Modified qualifier on Sunday morning (second heat of the day) as we raced sided by side most of the race. Hi, John! I had a great time photographing the event on Saturday. I missed Sunday unfortunately. I will email you when I get all the photos uploaded. It must be a rush driving! You have made a good set of panning photos! Thank you! It’s a technique I really take pride in. Yes it would! The owner of the boat really liked it too. I think it will find its way to his wall soon.